Lumi Industries sells LumiReact 3D printing resins, Fep, post processing products and filaments. Official Italian distributor of Fun To Do 3D printing resins . Post-processing non hazardous solvent for 3D printing resins. Solvent for 3D printing resins post-processing. Stronger than TEK1969 cleaning liquid, less aggressive than IPA. Manual immersion in a container (glass or polyethylene) and shake until uncured resin has dissolved. Blow the object with compressed air. 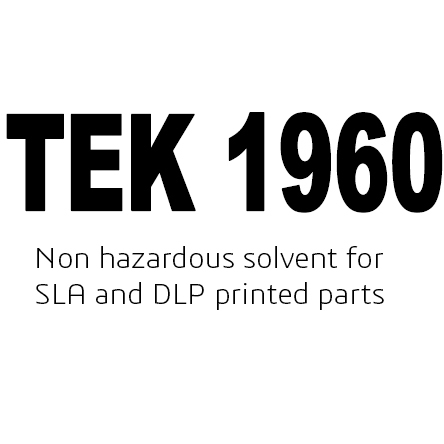 TEK 1960 has evaporation rate similar to water.